Be the first to share your favorite memory, photo or story of WILLETTA . This memorial page is dedicated for family, friends and future generations to celebrate the life of their loved one. Willetta “Joyce” Roberts, 88, passed away on Wednesday, April 10, 2019 after a long battle with Parkinson’s disease. Born on March 1, 1931, at Franklinton, Kentucky, Joyce was the oldest child of the late Huey Lee and Zeffie James Roberts. She was the owner of Joyce’s Beauty Salon in Pleasureville for forty years. 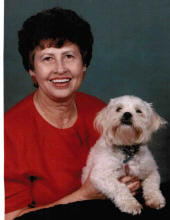 She was a member of Pleasureville United Methodist Church and served there in many capacities. Joyce was devoted to her family and friends (and pets) and always demonstrated that love by cooking. She could prepare a meal for two or twenty at a moment’s notice. Serving and giving to others was her passion. Left to cherish her memory are her three children: Valerie Sutherland (Bob) of Fort Myers, Florida, Keith Roberts (Diana) of Shelbyville, and Tim Roberts (Teresa) of Eminence; three grandchildren: Jamie Barker (Tim) of Maineville, Ohio, Ryan Abeo (Mariangela) of Seattle, Washington, and Danielle Roberts (Rodney) of Campbellsburg; four great-grandchildren, Mason Barker, Jackson Barker, Anna-Claire Barker, and Madison Abeo; her sister, Vicki League (Don) of Shelbyville, sister-in-law, Judy Roberts, of Pleasureville, and several step-grandchildren. She was preceded in death by a brother, Norman Roberts, and sister, Rosalyn Kelley. Funeral will be 2 p.m. Friday, April 19, 2019 at Sholar Funeral Home of Pleasureville, with visitation from 11 a.m. until 2 p.m. the day of the funeral. Rev. Don Hatton and Rev. Nick Coleman will officiate. Burial will be in Franklinton Cemetery. Don League will serve as honorary pallbearer. Active pallbearers will be Ryan Abeo, Tim Barker, Mason Barker, Jackson Barker, Rodney Fox, Todd Roberts, Shane Roberts, and Eric League. The family wishes to thank the many caregivers at Twin Oaks and New Castle Nursing and Rehab who provided loving care to Joyce for the last seven years. Online condolences may be expressed at sholarfuneralhome.com. To send flowers or a remembrance gift to the family of WILLETTA JOYCE ROBERTS, please visit our Tribute Store. "Email Address" would like to share the life celebration of WILLETTA JOYCE ROBERTS. Click on the "link" to go to share a favorite memory or leave a condolence message for the family.